Kettlebell training has become increasingly popular in recent years, with many dedicated gyms popping up all over the world. Strange looking devices, kettlebells weren’t originally designed as an exercise tool at all. They were originally designed and used in Russia in the 1700’s, for farmers to weigh their crops. What happens when you leave a bunch of guys with heavy things long enough? [caption id="attachment_3725" align="alignright" width="381"] Wiki (CC-BY-SA)[/caption] That’s right, testosterone takes over, and they are soon using them to show off their growing muscles, in odd, farmyard feats of strength. This method of livening up downtime on the farm continued until the turn of the 20th century, when kettlebells began turning up in gyms and at strength competitions across Russia and Europe. The transformation from farm to exercise tool was complete. 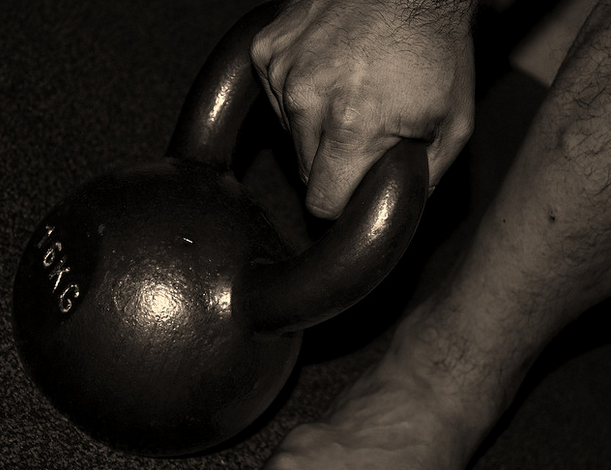 The Russian military even began using kettlebells as an integral part of their strength and conditioning programs. So, with all the high-tech equipment you find in gyms nowadays, does this odd shaped, centuries old, lump of metal have a place in the modern strength and bodybuilding workout? More importantly, is it just a fad? Is it just one of those trendy, retro things that are so popular right now? Well, yes and no. There are certainly some strange and quite frankly, dangerous things being done with kettlebells, that really shouldn’t be attempted by anybody but the most skilled and foolhardy of people. That said, there are some great advantages to using them. The nature of a kettlebell and its offset center of gravity recruits more stabilizing muscles during exercises. A greater degree of control is needed, and this means muscles and other tissues ordinarily ignored become an integral part of the lift. This can help to strengthen and stabilize joints, leading to a decreased injury risk. Kettlebells force you to think more about your form. This also helps iron out any defects and improves balance and coordination. For some lifts, kettlebells allow for a greater range of motion and a wider variety of grip options Translation - the muscles get a more thorough workout, and from different angles. For instance, when performing a shoulder press, the kettlebell will be resting against the back of your forearm. That allows you to almost bring your hands together at the top of the movement, giving your delts an extra squeeze. Using kettlebells can improve dynamic strength by performing more complex, multi-muscle exercises. For instance, bicep curls can be turned into shoulder presses far more easily, and smoothly than with big, clunky dumbbells. While movements like these are not the ideal way to stack on huge size, they serve to tie joints and exercises together, improving overall stability and decreasing injury risk. There are many movements you can do with kettlebells that you can’t do with other forms of weights. Exercises like halos, where you move the kettlebell around your head, are excellent for improving dynamic shoulder strength and mobility but would almost certainly result in two blacks eyes if performed with dumbbells. But pay attention with kettlebells so you know what your wrists are doing. It is easy to get lazy and start letting your wrists flop during lifts. This can lead to both acute and chronic wrist injuries, as well as elbow problems. Also, watch out for trapping fingers between the weights when using two kettlebells. Take it slow and steady, especially at first. 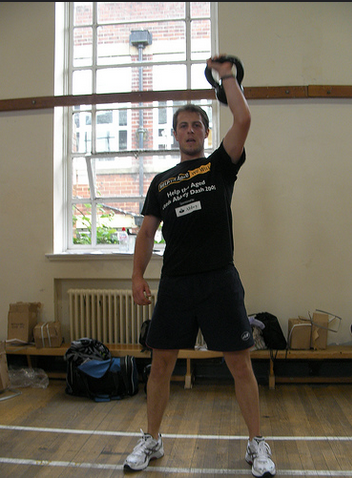 Concentrate on form and feel the way kettlebells work more than just the target muscle. Taking Sheer Strength Labs NO2 Nitric Oxide Booster will add a serious pump to your kettlebell workouts. The majority of the exercises detailed here are variations on gym standards; the big lifts you perform week in, week out. That’s because these lifts are the best for gaining muscle and strength. They have been tried and tested over generations. 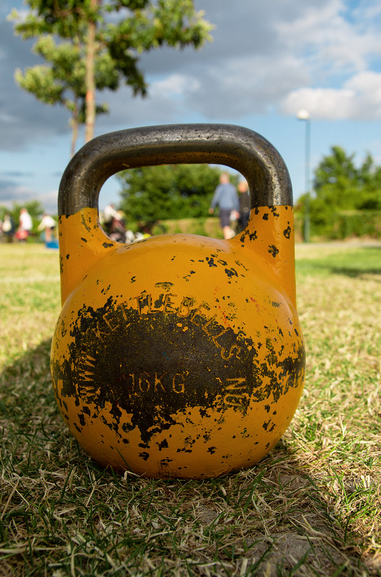 While there may be many other trademark kettlebell exercises that can aid in rehabilitation and mobility, you can’t beat the old favorites for building dynamic strength and muscle. The clean and press recruits a huge amount of muscle fiber and incorporates power as well as strength. Perfect the clean with far lighter kettlebells than you intend to use. Making certain you have the technique right before increasing the weight. Start with the bells by your sides. Using a little swing, clean them upwards, as you let the handles slip through your hands, allowing the body of the kettlebells to rest on the backs of your forearms, ready to be pressed overhead. Now steadily press the weights upwards, using whatever grip feels natural to your shoulders. Squeeze at the top and return to the start. You can also adapt this exercise to be a curl and press, to combine biceps and delts. The squat is an exercise that should be in any bodybuilder or strength athlete’s workout routine. It is the king all round leg builder, as well as being great for core stability and overall growth, due to the way it boosts anabolic hormones. The kettlebell squat offers something different. While it doesn’t allow for huge weights to be used, it does incorporate more of the body. [caption id="attachment_3724" align="alignleft" width="400"] Wiki (Public Domain)[/caption] Clean the kettlebells and hold them together, in front of your chest. Set your feet and drop into the squat. Due to the lighter weight, you may want to go lower than usual. Now push the floor away, and feel the way the position incorporates more muscles of the upper body, specifically the upper back. Variations include turning the squat into more of a power move and adding a jump. You can also add a press at the top of each squat, or actually perform the squat in a press position. These moves help build shoulder stability in a safer way than with a barbell. Using Sheer Strength Labs Sheer Alpha Testosterone Booster will accentuate the anabolic effects of squats and push your test levels through the roof. More testosterone means more muscle! These is an excellent, dynamic take on the bent row; landing somewhere between a barbell and a dumbbell version of the exercise. To perform this exercise, you need to brace yourself keeping your lower back stable and safe. The best way to do this is to step forward, drop your weight over your front leg, and stand in a calf stretch position. Now, holding a kettlebell in both hands, lean forwards and begin by rowing one arm upward as you would for a dumbbell row. Squeeze at the top and begin to lower as you raise the other bell. The weights should pass in the middle. Feel the dynamic way this hits your entire upper back. Have you guessed what this might involve yet? Yep, take two kettlebells and clean them up to chest height. Lay back on a flat, declined or inclined bench, depending on what part of your chest you plan to work the most. Begin by pressing one bell upwards, before lowering and raising the other, as you would with seesaw rows. This hits the chest and shoulders in a more dynamic way than the standard bench press, and the lower centre of gravity offered by the kettlebells promotes greater stability. [caption id="attachment_3723" align="alignright" width="400"] Rob Gillies @ Flickr (CC-BY-ND)[/caption] Like squats, the deadlift is a huge muscle building exercise boosting anabolic hormones. The deadlift incorporates more muscle groups than any other lift you can perform in the gym. You won’t be hitting any PB’s using kettlebells, but you can perform a few variations to keep your body guessing. The obvious way to perform kettlebell deadlifts is with a bell in each hand, start from outside of your feet. Due to the nature of this technique, the movement will fall between a deadlift and a squat, similar to when you use a diamond bar. Another variation is to use one or two kettlebells, taken from between the legs. This is easier to perform using a wider leg stance, as in a sumo deadlift. You can also do one sided kettlebell lifts called suitcase lifts, but these are not recommended if you are rehabilitating a back injury. The farmer’s walk is a strongman staple. It improves grip strength while blasting your legs, back, and traps. Kettlebells are better than dumbbells for this exercise because they won’t impede your leg movements as much. Grab a good sized kettlebell in each hand and stand with your shoulders down and back. Now walk up and down the gym until either your legs and back are burning, or your grip is about to fail. For an extra blast, you could add in a set of shrugs or deadlifts before you turn around each time. Taking Sheer Strength Labs Creatine Monohydrate keeps you going longer and stronger. Now, add kettlebells to your workout routines. They add dynamic strength and muscle, as well as reducing injury risk by strengthening your stabilizing muscles. Jonathan Warren is a national level physique competitor and personal trainer with multiple certifications including NASM, NCCPT, and IKFF. His specializations include mobility training and corrective exercise as well as contest preparation.